Combine chicken and salsa in bowl. 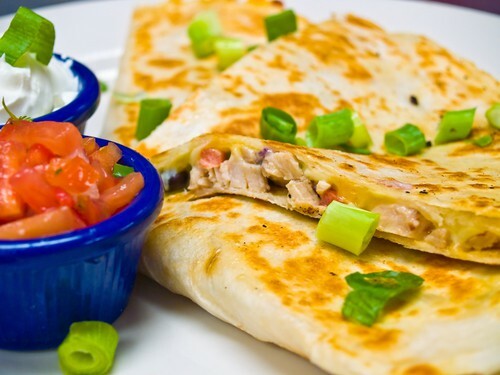 Divide chicken mixture, cheese and green onions evenly among 4 tortillas. Cover with remaining tortillas. Heat one tortilla stack in a large skillet over medium heat for 2-3 minutes. Turn tortilla over and repeat for another 2-3 minutes or until cheese is melted. Repeat with remaining tortilla stacks. Serve with Jimmy’s Holy Smoke! Dip.